There are tons of mattress brands, styles, and options currently on the market. And while you may be tempted to go with the mattress maker that has the flashiest ads and the most impressive sounding mattresses, this doesn’t ensure that you are getting a truly great product. The better alternative may be to go with a small company that you don’t initially recognize. The handcrafted mattresses these companies produce rival the big players in the industry and often have features and benefits you won’t be able to find elsewhere. Read on to learn exactly what those benefits are. When each and every mattress is made by the hand of a mattress expert, no detail gets overlooked. Each mattress must meet exacting standards for quality before it reaches the showroom floor. The other companies use factories and machinery to manufacture their mattresses, making quality control a persistent issue. Handcrafted mattress are often the most innovative in the industry. Why? It’s because there is the flexibility to experiment with new techniques and bedding products. These mattress makers are not locked into a certain way of doing things, freeing them up to constantly search for superior materials and exciting designs. There is a reason that a company commits to making handcrafted mattresses – they value careful craftsmanship and the satisfaction the comes from making a great product. That kind of commitment is hard to find these days. Some companies continue to make mattresses the traditional way because they don’t understand the deep relationship between a good mattress and a good night’s sleep. 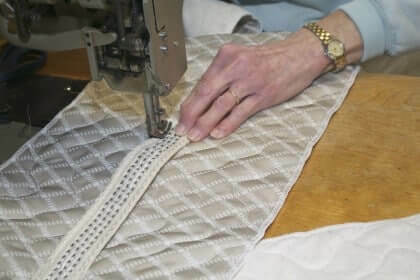 Since 1929, Beloit Mattress has been making handcrafted mattresses one stitch at a time. We are a family-run business with an experienced and helpful staff. For those reasons, people from throughout the region seek us out every time they need to make a mattress purchase. If you are ready to start falling asleep faster, sleeping deeper, and waking up feeling truly rested, our handcrafted mattresse are the right option for you.